Kerala hosts almost all Hindu, Christian and Muslim festivals with the same enthusiasm and charm. Festivals of Kerala are famous also because they involve various aspects of day to day life such as temple, boat, bamboo etc. An ancient art form, more than eight centuries old, Theyyam is one of the most spectacular of the ritual arts forms of Northern Kerala. Theyyam performances include the myths and stories of the many gods and celestial spirits in Kerala mythology, and its performers are vigilant and committed to guarding the purity of the art form and preserving its ritualistic heritage. Christmas brings in the season of joy and cheerfulness to the households of Kerala. The holy birth of baby Jesus is rejoiced by the people with customs and traditions that have a tag of local flavour. The brilliance of Christmas stars the serenity of cribs and glittering Christmas trees offer the warmth to celebrate this winter fiesta. And of course with the quintessential Santa Claus and Christmas gifts - the joyous season of Christmas ushers an array of hope and jollity to the people of Kerala. To cherish this festive season, we have for you a collection of videos that convey the spirit of Christmas. Chettikulangara Bharani, the annual festival held at the Chettikulangara temple during the Malayalam month of Kumbham (February-March). 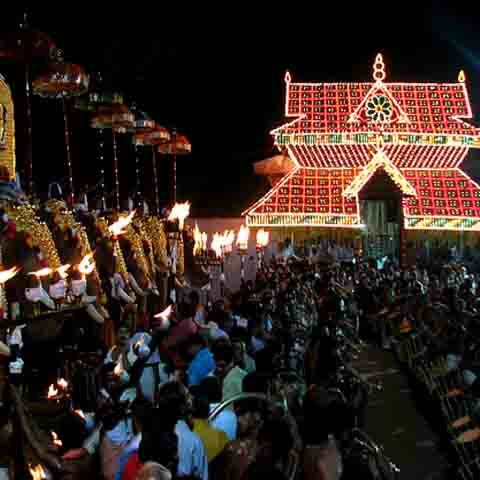 The festival and the temple are dedicated to Goddess Bhagavathy. Eid is an important religious holiday celebrated by Muslims worldwide that marks the end of Ramadan and Hajj Month, the Islamic holy month of fasting (sawm). The religious Eid is the first and only day in the month of Shawwal during which Muslims are not permitted to fast. The holiday celebrates the conclusion of the 29 or 30 days of dawn-to-sunset fasting during the entire month of Ramadan. Eid al-Adha, also called the "Sacrifice Feast", is the second of two Muslim holidays celebrated worldwide each year, and considered the holier of the two. It honors the willingness of Ibrahim (Abraham) to sacrifice his son, as an act of submission to God's command, before God then intervened sending his angel Jibra'il (Gabriel) to inform him that his sacrifice had already been accepted. Kalpathi (Kalpathy) Ratholsavam is an annual Hindu Temple festival in the Kalpathi village of Palakkad district in Kerala state, south India. The festival is at the Sri Visalakshi Sametha Sri Viswanatha Swamy temple where the deities are Lord Siva (Lord Viswanatha) and his consort Visalakshi, another name for Parvati. The annual ten-day chariot festival conducted here during the month of November is one of the most remarkable festivals of Kerala. Vedic recitals and cultural programmes are held in the temple during the first four days of the festival. Attukal Pongala is the main festival of this temple. Attukal Pongala Mahotsavam is a 10 days festival which falls on February - March every year (Malayalam month of Kumbham). 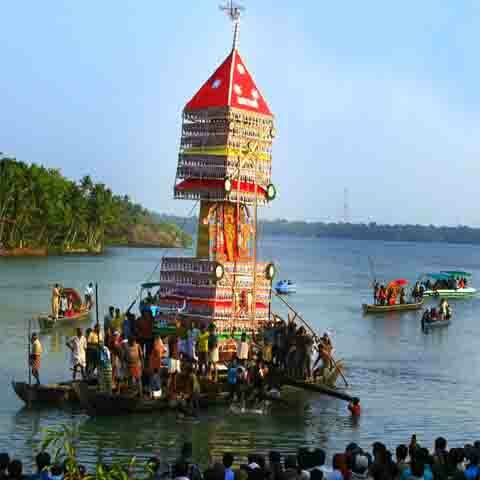 The festival begins on the Karthika star with the traditional Kappukettu and Kudiyiruthu ceremony, the idol of Devi, is embellished with Kappu (Bangles). 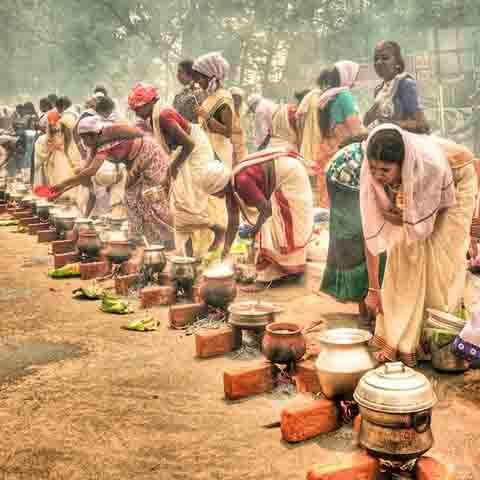 The 9th day of the festival is the major attraction, The Attukal Pongala day and the festival will conclude with the Kuruthitharpanam at 10th day night. 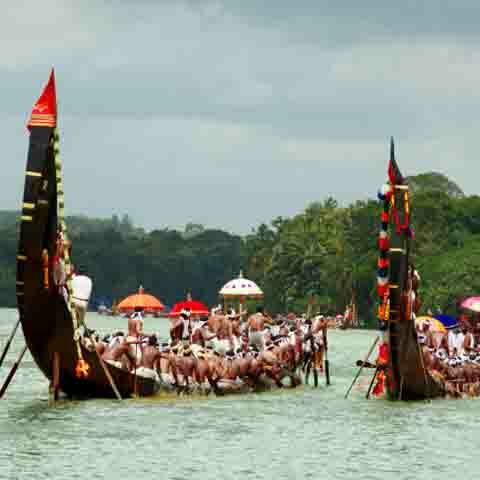 The Aranmula Boat Race the oldest river boat fiesta in Kerala, the south western State of India is held during Onam (August–September). It takes place at Aranmula, near a Hindu temple dedicated to Lord Krishna and Arjuna. The snake boats move in pairs to the rhythm of full-throated singing and shouting watched by an exciting crowd. In 1972, snake boat races were also added to the program of the festival. Thousands of people gather on the banks of the river Pampa to watch the snake boat races. 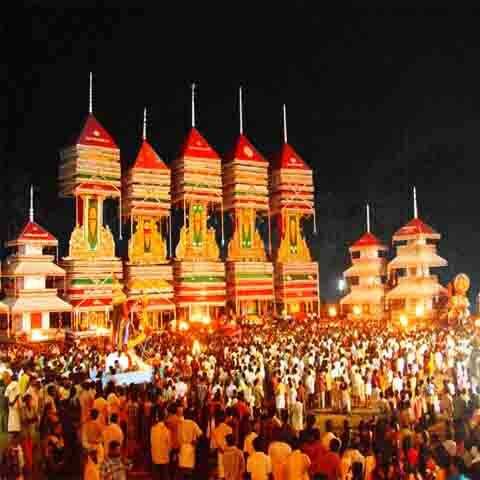 Poruvazhi Malanada Temple is also noted for a spectacular event called Malanada Kettukazcha a one-day festival celebrated in the month of March. The procession is a fascinating sight in which decorated structures are taken out to the accompaniment of traditional orchestra of drums. Some of these structures are 70 to 80 ft tall and they are made in a competitive spirit by the people of the surrounding villages. The structures are either carried on the shoulders or taken out on chariots. The event attracts large number of devotees every year. The Vaikom temple is famous for the Vaikom Ashtami (Vaikathashtami), one of its main festivals, which is held in November–December. The exact date of the festival is determined by the Malayalam calendar. Vaikathashtami is celebrated on the day of Krishna Ashtami. The legend behind this festival is that years ago a saint man named Vyaghrapada prayed to God siva for years after many years God siva and his wife Parvathy Devi appeared in front of him. It is believed that god Siva appeared in front of him in the day of Krishna Ashtami. So as a memory of this Vaikathashtami is celebrated. It is the festival extending for 12 days. 12th day is Vaikathashtami. 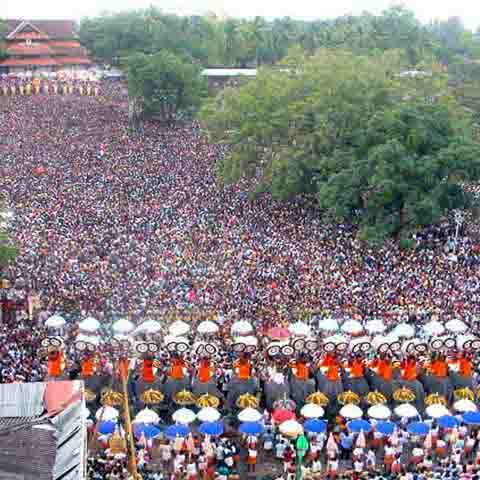 Thrissur Pooram is an annual Hindu temple festival held in Kerala, India. 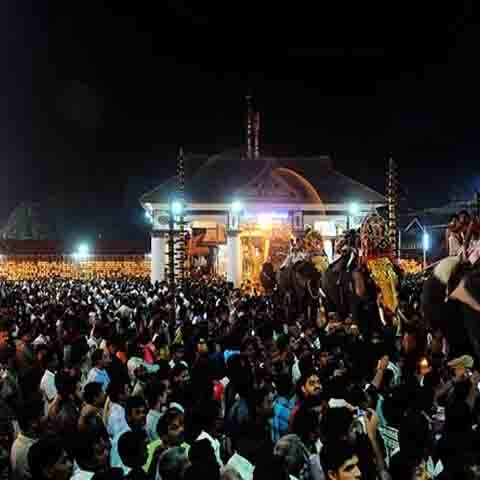 It is held at the Vadakkunnathan Temple in Thrissur every year on the Pooram (Malayalam: പൂരം, pronounced [puːɾam]) day - the day when the moon rises with the Pooram star in the Malayalam Calendar month of Medam. 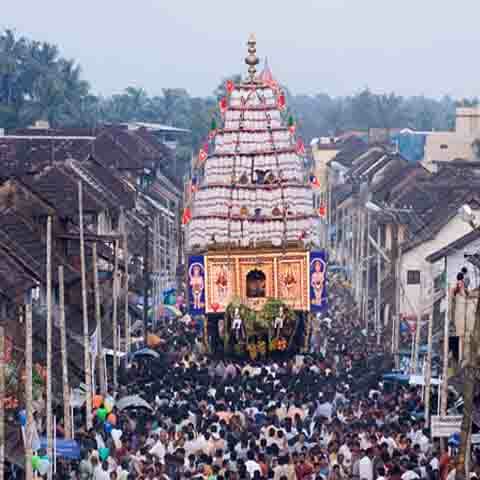 It is the largest and most famous of all Poorams. 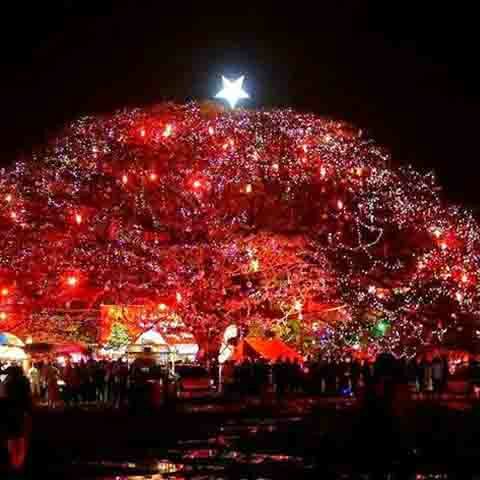 Arattupuzha Pooram is a popular temple festival of India. The annual festival at Arattupuzha is also termed as the mother of all pooram festivals in Kerala, due to its sheer magnitude and grandeur. Visitors from nearby and far off places reach the village of Arattupuzha during the festival days, to be part of this grand festival. The pinnacle of excitement and devotion during the seven-day festival is the last two days.